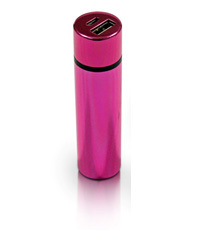 The new, completely rechargeable PBK-68 from LMS Data is your ideal companion for all your mobiles devices. Featuring a high capacity, 3000mAh rechargeable battery, all in a stylish, aluminium design, not much bigger than an AA battery. Total charging flexibilty is assured since it uses a standard USB-port for charging your device, including iPod., iPhone., Android. and Blackberry. compatible devices – simply use your existing USB charge cable!